Another school year is off to a great start. But I'm blogging so late in the day! In years past I've hustled home after drop off and posted pictures right away, but this year is different (more on that in my next blog post). 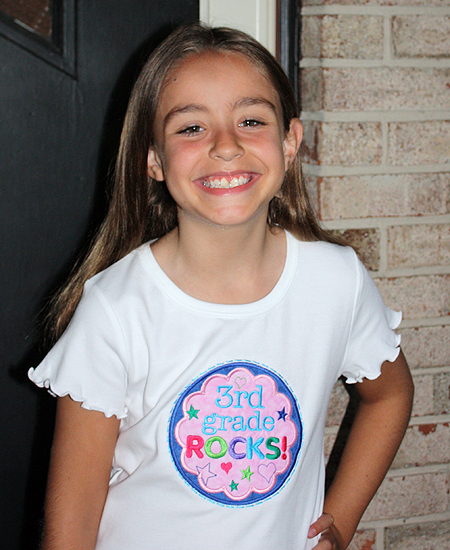 For Annaliese's shirt I used Lynnie Pinnie's Third Grade Rocks design. 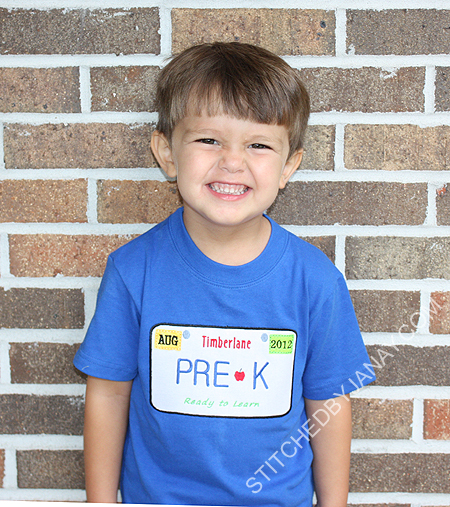 For Dashiell's shirt I used East Coast Applique's Pre-K tag design. 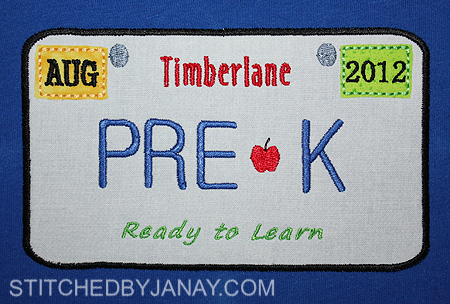 I customized it with our school name using the Tiny Alphabet from 8 Claws and a Paw. 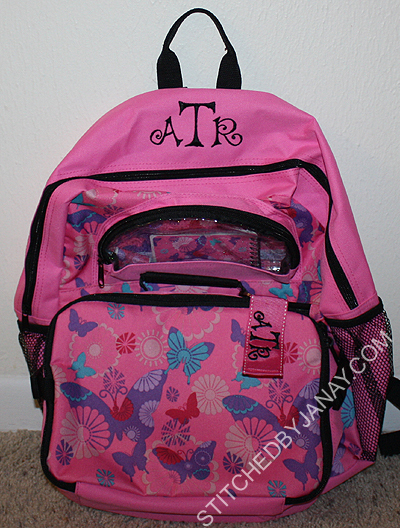 Annaliese has used the same backpack for 3 years so I suppose it's time for a new one! I found myself monogramming this at 8:45pm last night... talk about waiting until the last minute! 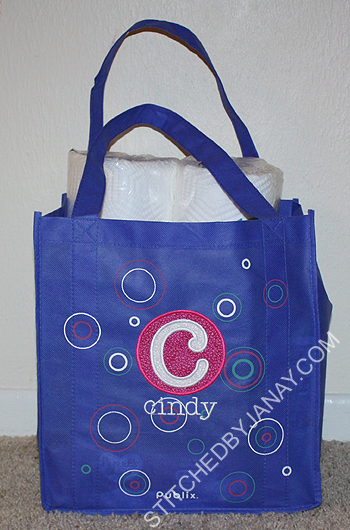 I used 8CP's Pizazz to create the monogram. I love the way her initials look in this font! 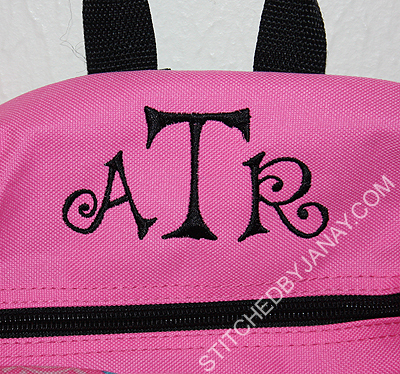 There was no easy way to put the monogram on the front the way the pockets are and how the lunch box attaches, so I put it on the top. 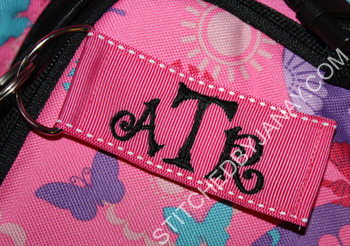 And there was no way I could monogram the lunch box, so I made a little keychain out of ribbon to attach to the handle. 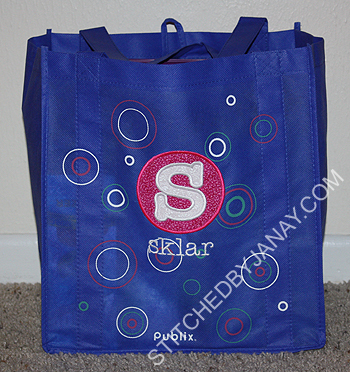 Like last year, I monogrammed a Publix shopping bag for their teachers, and we used them to deliver all their school supplies. This is the Taylor Monogram font Lynnie Pinnie. 3 comments on "First Day of School 2012"
Very nice and creative! Thanks for sharing! Janay, The kiddos look so happy in their awesome bts shirts! You are so darn creative. 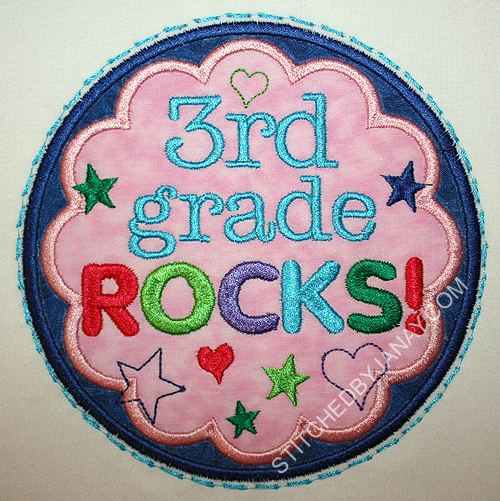 And to build on a previous discussion from a few months ago, It is so refreshing to see back to school shirts with positive messages like "Third Grade Rocks!" rather than some snotty little comment about hating school or not doing homework. Thanks for being that kind of mom, and for bringing your little ones up to be respectful and enthusiastic! 800 is the number of the day! 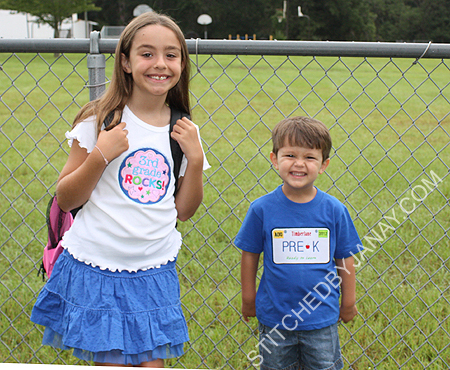 Sibling Shirts, Fireman and Princess style! School Spirit Time Three, the 2012 Edition! Ready to cheer on the Noles! Floral Bouquet saves the day!